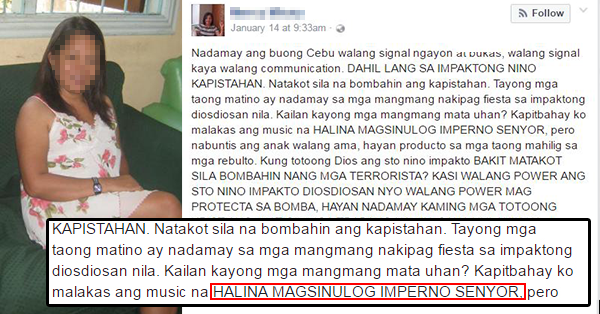 VIRAL: "IMPAKTO DIOSDIOSAN NIYO" A Netizen Mocked The Sinulog Festival! The Sinulog Festival is a ritual activity that is being celebrated annually in Cebu City. It is celebrating the feast of Sto. Nino on the third Sunday of January every year. The word Sinulog is derived from the word "sinulog" which means “like water current movement” that describes the forward-backward movement of the Sinulog dance. The main event of this festival is the grand dance parade where the devotees are holding their own kinds of Sto, Nino. The parade will last from 9 hours to 12 hours with participants from different parts of towns and cities. But not only Cebuanos can join the feast because the participants come from different parts of the globe. The Sinulog dancers are wearing colorful dresses and dance to the tunes of drums, trumpets and gongs. But one incident happened during the feast of Sto.Nino, a woman named Mercy Mirata was very upset and posted her disappointment regarding of the said event. She was saying that there was no network signal in the area because of the parade. The woman also questioned the beliefs of the devotees of Sto. Nino. Look at the picture below to see her real post. The netizens are very mad and bashed Mercy on the internet. The said post earned 24,000 reactions and 26,000 shares. What can you say about the story? Let us hear from you. Write your comments below.